In 2010, TV Guide ranked Get Smart’s opening title sequence at No. 2 on its list of TV’s Top 10 Credits Sequences, as selected by readers. The nemesis of CONTROL is KAOS, described as “an international organization of evil.” KAOS was supposedly formed inBucharest, Romania, in 1904. Neither CONTROL nor KAOS is actually an acronym. Many actors appeared as KAOS agents, including Tom Bosley, John Byner, Victor French, Alice Ghostley, Ted Knight, Pat Paulsen, Tom Poston, Robert Middleton,Barry Newman, Julie Newmar, Vincent Price, William Schallert (who also had a recurring role as The Admiral, the first Chief of Control), Larry Storch. Conrad Siegfried, played by Bernie Kopell, was Smart’s KAOS archenemy. King Moody (originally appearing as a generic KAOS killer) portrayed the dim-witted but burly Shtarker, Siegfried’s assistant. 99’s name is never revealed in the series. Even “99’s mother” never refers to her daughter by name. Her name is not even mentioned at her wedding. Max and 99 marry in season four and have twins (Zachary and Janie, though their names are never said ) in season five. Agent 99 became the first woman on an American hit sitcom to keep her job after marriage and motherhood. Although the cast and crew—especially Adams—contributed joke and gadget ideas, dialogue was rarely ad-libbed. An exception is the third season episode, “The Little Black Book.” Don Rickles encouraged Adams to misbehave, and ad-libbed. The result was so successful that the single episode was turned into a two-part episode. 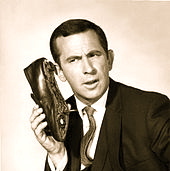 Don Adams, as Maxwell Smart, holding the famous shoe phone. CONTROL is a spy agency founded at the beginning of the Twentieth Century by Harold Harmon Hargrade, a career officer in the United States Navy’s N-2 (Intelligence) Branch. Hargrade served as the first Chief of CONTROL. “CONTROL” is not an acronym, but it is always shown in all capital letters as if it were. 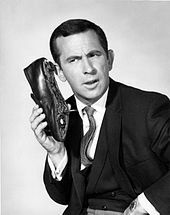 Maxwell Smart, code number Agent 86, (born 1930, portrayed by Don Adams) is the central character. Despite being a top secret government agent, he is absurdly clumsy, very naive and has occasional lapses of attention. Due to his frequent verbal gaffes and physical miscues, most of the people Smart encounters believe he is grossly incompetent. Despite these faults, Smart is also resourceful, skilled in hand-to-hand combat, a proficient marksman, and incredibly lucky. These assets have led to him having a phenomenal record of success in times of crisis in which he has often averted disaster, often on a national or global scale. This performance record means his only punishment in CONTROL for his mistakes is that he is the only agent without three weeks annual vacation time. Smart uses multiple cover identities, but the one used most often is as a greeting card salesman/executive. Owing to multiple assassination attempts, he tells his landlord he is in the insurance business, and on one occasion, that he works for the “Bureau of Internal Revenue”. Smart served in the US Armyduring the Korean War and is an ensign in the US Navy Reserve. In 1999 TV Guide ranked Maxwell Smart number 19 on its 50 Greatest TV Characters of All Time list. The character appeared in every episode (though only briefly in “Ice Station Siegfried,” as Don Adams was performing in Las Vegas for two weeks to settle gambling debts). Agent 99 (Barbara Feldon) is the tall, beautiful female agent whose appearance is useful in undercover operations. Generally, Agent 99 is much more competent than Smart, but Smart saves her life in several episodes. In “Snoopy Smart vs the Red Baron” is the introduction of 99’s mother (Jane Dulo), who is so thoroughly fooled by her daughter and Smart’s cover stories that not even seeing them in combat while a prisoner of KAOS convinces her otherwise; it is hinted that 99’s father was also a spy. Creator Buck Henry pointed out to actress Barbara Feldon on the DVD commentary for Season 3 that when he tried to add funny lines for Agent 99, “They didn’t want you to be ‘joke funny.’ They wanted you to be glamorous and interesting.” Her name was intentionally never revealed. She appeared in all but seven episodes. She can typically be seen slouching, leaning, or sitting in scenes with Adams to hide the fact that she was slightly taller (5′ 9″ or 1.75 m) than Adams (5′ 8½” or 1.74 m). The Chief (Edward Platt) is the head of CONTROL. Although sarcastic and grouchy, the Chief is intelligent, serious, and sensible. He began his career at CONTROL as “Agent Q.” (He joined the organization back when they assigned letters rather than numbers.) He is supportive of Agents 86 and 99, but he is frustrated with Smart for his frequent failures and foul-ups. As revealed in the season-one episode “The Day Smart Turned Chicken,” his first name is Thaddeus, but it is rarely used. His cover identity (used primarily with 99’s mom) is “Harold Clark.” Another time, when KAOS arranges for the Chief to be recalled to active duty in the US Navy (as a common seaman with Smart as his commanding officer), his official name is John Doe. Agent 8 (Burt Mustin) is a retired CONTROL agent who appears in episode twenty three. He was revealed to be the Chief’s best friend from his days at CONTROL. Agent 44 (Victor French) is Agent 13’s predecessor and is also stationed in tight corners. Agent 44 sometimes falls into bouts of self-pity and complaining, and he would sometimes try to keep Max chatting for the company. Agent 44 appeared in several episodes in the second half of the season one. In the final season, there was a new Agent 44, (played by Al Molinaro) in two episodes. (Prior to starting as 44, Victor French had a brief guest role in the season-one episode “Too Many Chiefs” as Smart’s Mutual Insurance agent.) In the 2008 film, his trait of self-pity and attempts at small talk are incorporated into Agent 13, hiding in a tree.